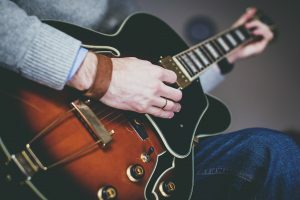 If you’ve just started a band and are looking to make it a success, you’ve come to the right place! 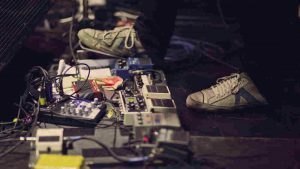 Here are 17 practical tips for bands starting out that’ll set you on a surefire path to industry success. Many bands are wildly inconsistent in their work ethic and expect a significant reception from day one, then get frustrated after six months and give up. Keep in mind that achieving long-term, sustainable success is a marathon rather than a sprint and you will have to treat it as such. An effective sonic identity is made up of a consistent, identifiable genre and a host of signature traits (songwriting style, guitar tone & technique, drum fills etc.) that set you apart from other bands. It often takes time to achieve a fully-realized sonic identity, but it’s certainly worth making a conscious effort to settle into a consistent genre and leverage your signature traits. This will give your music a truly unmistakable quality, which is a necessary component of standing out from the thousands of other bands who are also vying for the attention of both audience & industry. A fully-realized visual identity is one of the most significant attributes to building a loyal fanbase. However, it’s often largely underestimated by independent bands. Visual identity consists of the cultural and personable aspects of the band (fashion sense, member personalities, branding & artwork etc). It’s key to remember that whilst music consumers of course form a connection with the music itself, they also grow a strong attachment to the shared values, morals, lifestyle choices and personalities of the band members. Your main promotional picture is arguably the most integral aspect of your marketing. A high-resolution, well-planned picture exudes professionalism and effectively communicates your visual identity. Conversely, a low-quality picture will almost always leave a bad impression before you’ve even been given a fair crack of the whip by a potential fan or an industry operator. Additionally, festival/gig applications and publications will often require a high-resolution picture for promotional purposes. Achieve the highest resolution possible: You can always reduce the resolution later, but you can’t increase it. Make sure it effectively communicates your visual identity: If you’re a dynamic and personable indie-folk band from London, think how that can be incorporated through your fashion, facial expressions and the setting of the picture. Come up with something original: Standing against a brick wall and looking moody has been done many times over. It’s important to make sure all members are on the same page regarding the intentions of the project upon formation. Therefore, there won’t be any confusion when it comes to the commitment level of each member further down the line. If you’re planning to be a chart-topping rock band, then a high level of commitment and dedication will be required. However, if you’re just planning to play covers and do a few local gigs, a lower level of commitment and a more laid-back attitude will suffice. Make logistics & expectations clear: An effective agreement should outline the band’s logistics as well as the roles and commitments of each member. Additionally, it should detail the consequences of failing to meet commitments. Divide & direct assets: Assets include intellectual property (such as songs and the band name), income and invested capital. Dividing and directing assets can effectively prevent a legal dispute in the future. Outline what happens in the event of a break up or a member leaving: The last thing you want is a former band member suing you for a share of your assets. With no written agreement in place, they could try and claim assets they don’t own or work they didn’t do. Start with your own sonic & visual identity. What sort of people would best connect with the music you make and the people you are? Who has previously taken interest in your music? Why did they take interest? Look at other bands within your genre or local scene. What kind of people are their fans? How do they interact with the bands both online and offline? Once your work is registered with a music publisher, they’ll collect and manage your royalties and often help you gain lucrative synchronization deals. Additionally, distributing your publishing rights early on will prevent a huge dispute if you’re earning significant income further down the line. Have a band meeting and identify the talents and strengths of each individual member, then delegate roles accordingly. If the bassist is the strongest writer, let them handle emails and copywriting. If your singer is the most personable, let them handle social media & networking. In addition, industry operators will often want to deal with a set representative for the band rather than trying to go back and forth with several different members. Make it easy for them by delegating roles. Many independent bands underestimate the importance of having a dedicated website. Whilst social media is of course a central aspect of independent music marketing, it’s important to remember you’re operating on a platform that you don’t own (and are therefore subject to regulations and changes that can drastically affect your content). Having your own website puts you in full control and acts as a rendevouz point for all of your online activity. If you’re looking to build your own website, I’d highly recommend Bluehost. They offer hosting from under $4 a month and include a free domain and SSL certificate. When setting up your social media profiles, make sure you find a single username that can be used across all of your social media channels. In addition, make sure you interlink all of your social media channels and redirect everything back to your website. Make it as easy as possible for your audience to connect with you. I’d strongly recommend going down the home studio route. Instead of spending several hundred dollars on a single recording session, you can invest the same amount of money in a home studio setup that’ll produce great quality recordings for years to come. In addition, learning how to engineer and produce your own music will pay serious dividends in the long run. If you’d rather have someone else handle the engineering and producing side of things, you can always make a friend who knows what they’re doing. This is especially relevant if you’re in school or college as most budding engineers & producers will be willing to work either for free or for a very reasonable price. When you’re first starting out, two of your biggest priorities are going to be gaining experience and building a name for yourselves. Playing live on a regular basis is a fantastic way to achieve both of these. 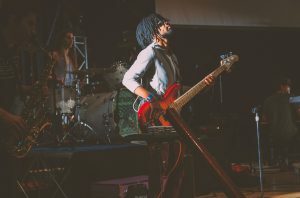 The entire process of playing a show (from loading gear in and out of the venue to interacting with the audience) requires first-hand experience. With every show you play, the band will improve and you’ll learn something new. In addition, you’ll gradually expand your industry network as well as your fanbase. I’d also highly recommend playing gigs outside of your local area as soon as you feel ready. This is a vital component of building your fanbase and is particularly important if you live in a less-populated area. Promoter contact details can be found online if you’re looking to play shows outside of your local area. Building a sizeable industry network, like any other aspect of playing in a band, takes consistent effort over an extended period of time. When networking, it’s important to show genuine interest in the industry operator before you try to bring your band up. If you want to support a bigger band, share their music online or go to one of their shows first. If you’re interested in working with an artist manager, do some research on their career first. This is an instant standout factor and the topic of your own band will naturally come up in conversation. Become fans of other bands: Share their music online, keep up to date with their activities, buy their merch and attend their shows. Start attending shows and industry events that you aren’t playing at: Do some research beforehand and take a genuine interest in the work of others. Don’t try to force your band on others from the get-go: If they’re interested in working with you, they’ll ask you about your own projects. Whilst you might still be getting used to playing with each other, it’s important to take a methodical and goal-focused approach to rehearsing. Make sure you plan each rehearsal in advance and learn the material beforehand to avoid wasting time. I’d also thoroughly recommend keeping a practice journal in order to track your progress and plan effectively. 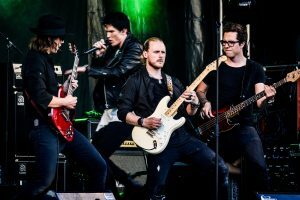 For more guidance on effective and productive rehearsal, check out our article on 20 band practice tips that actually work. In order for consistent growth & development to be achieved, consistent time and effort needs to be put in on the front end. Many bands complain about a lack of overall traction, yet will go weeks or even months at a time without posting on social media or playing live. To achieve consistent traction, time needs to be set aside to work on the band. Take a couple of hours each day to work on new music, arrange rehearsals/gigs, schedule social media posts and learn more about the industry. With everything you do, it’s important to reflect & review both your successes and failures. Take into account what went well (and why) as well as what you could’ve done differently (and why). I can tell you almost for certain that you’ll most likely fail more times than you succeed, but failing (and subsequently learning from it) is a necessary step to achieve long-term, sustainable success.